We were very sorry to hear that our good mate Fred McCormick died on Sunday 15th November. He had been in hospital for over a month with complications arising from an underlying breathing/cardiac condition. At his Humanist Celebration of Life on 7th December a gathering of Fred's friends and family (wearing red scarves and ties to reflect his socialist beliefs) met to celebrate his life with songs, remembrances and a jazz tune to play him out. 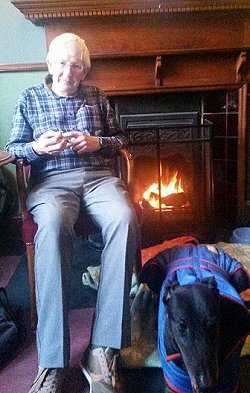 Fred was a member of the Liverpool Socialist choir, an activist in Wirral United Community Branch (often out on protests with his dog Taffy), a long term member of Comhaltas in Liverpool, a dedicated contributor to the Belvedere singing sessions and many other local events. Fred loved to be part of the singing communities at the Sheffield Carols; he followed jazz bands in the North West, never missing the Keswick Jazz Festival. Fred writes eloquently in Ten Records that Changed My Life about the "wasteland" of his education where he felt that working class people were patronised and disempowered. He was largely self taught, forming his intellectual framework under the influence of Ewan MacColl and other left wing thinkers. By the late 1970s he was at University. He studied Social Sciences and Irish History at the University of Ulster's Coleraine campus, graduating in 1978, and also acquired a good knowledge of the Irish language which later informed his reviews of CDs of sean-nós singers and of books on Irish music and culture. In Ten Records ... he writes passionately about the panorama of ethnic music he gradually discovered on LP and also about his visit to Carna in the Gaelic speaking area of Connemara and how he was overwhelmed by the experience of that living tradition. 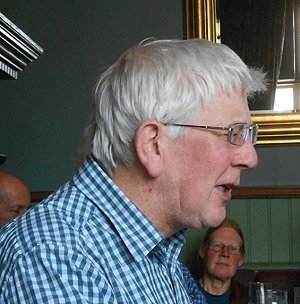 He developed his own singing style in the high tenor mode of many sean-nós singers and was a familiar figure at folk festivals and events featuring traditional singers notably the National at Loughborough (where probably we first met in the early '70s) and Sutton Bonington. He also ran sessions at Holmfirth Festival and toured from time to time with Bruce Scott and also Joe Kerins. Fred was a songwriter and published a CD & booklet The Song I'm Composing in 2001. Many of these songs reflect his strong belief in left wing politics (e.g. Bugger the Bankers): others such as the mock-heroic Bacon Butty are richly comic and have been taken up by other singers. At political song sessions at the annual Whitby Festival he could be relied upon to come up with a new song on the latest contentious topic. He's on You Tube, the Radical Liverpool website, singing Out of Work and on the Dole. Fred was passionate - some might say opinionated - about traditional music. Many of his friends remember sharply argued exchanges arising from his love of the music. 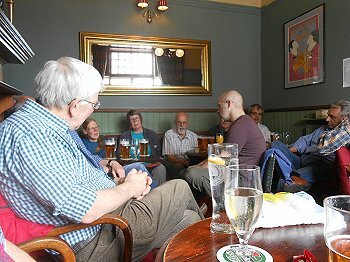 We remember many a long night (Fred would sleep on our floor while visiting London for events such as the Traditional Song Forum at Cecil Sharp House or our own Musical Traditions Club) debating Ewan MacColl vs Bert Lloyd, or the merits of some performer or reviewer. Fred has written extensively, many reviews for English Dance & Song plus over 60 reviews in Musical Traditions and several articles, always engaging passionately with the music, the presentation and the notes - often taking issue with these and sometimes being harshly critical. One piece included the disclaimer "I am sorry if that sounds nit-picking, but ..." Many felt that it did and it lost him some friends in the academic world. However, from comments on Mudcat Café thread # 158450 latterly it seems that affection has prevailed and there are tributes to his "enthusiasm, integrity and ability", "erudite and fair-minded posts". 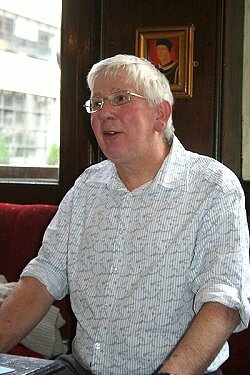 Fred's broad appreciation and enthusiasm was akin to that of Keith Summers (1948-2004), recorder of traditional singers and musicians in England and Ireland and original editor of Musical Traditions Magazine, Fred being briefly a co-editor of Rod Stradling's internet version. Fred was a great friend to ourselves and to the late Keith Summers, helping us with the difficult task of clearing his house and finding homes for his record collection. Fred's own collection has been bequeathed to the Institute of Popular Music at the University of Liverpool where he lectured for a short period following his redundancy from his Civil Service job in the Wirral.